Anxiety and depression are two common mental health problems. Anxiety involves ongoing and disproportionately strong feelings of fear, worry or stress, which can happen out of the blue or in response to particular situations or objects. It also involves avoiding situations and objects that may cause fear or worry. Depression involves ongoing feelings of sadness, emptiness or irritability. 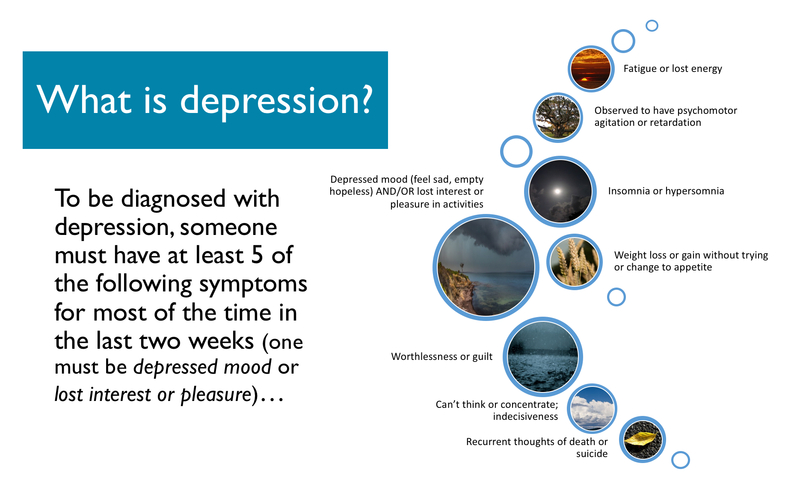 Below is an example of some symptoms associated with depression. Both anxiety and depression impair a person’s ability to function in their lives, and are associated with various behavioural, cognitive and physiological changes. Anxiety and depression often occur together. 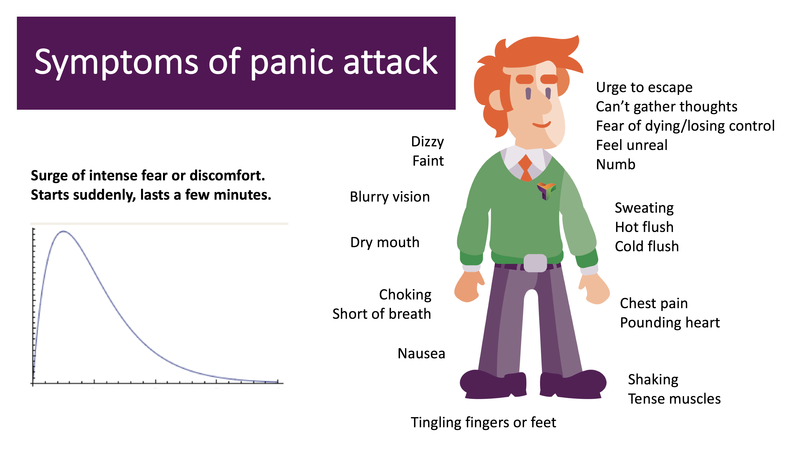 Symptoms of a panic attack can occur out of the blue or in response to a certain situation or object. Experiencing many panic attacks is known as panic disorder. Anxiety and depression are 1.5 to 2.4 times more common in people with asthma than people without asthma (Scott et al. 2007, Strine et al. 2008). This difference is maintained across the lifespan, from childhood to older age (Meuret et al. 2006, Ng et al. 2007, Lu et al. 2012). Children and young people with asthma are also at risk of developing mental health problems in the future (Alati et al. 2005, Hasler et al. 2005). The prevalence of anxiety and depression in people with asthma varies across settings and countries. One in three people with asthma will have an anxiety disorder at some point in their lives, most commonly panic attacks (25%) or panic disorder/agoraphobia (12%) (Weiser 2007). In the general community, 12-month prevalence of different anxiety disorders is around 4-5% and depression is 6% (Scott et al. 2007). In treatment settings, the prevalence is much higher (Valença et al. 2006). Across countries, estimates as high as 12.5% are seen for agoraphobia or panic disorder in South Africa and 25.5% for depression in Ukraine (Scott et al. 2007). In people with severe or uncontrolled asthma, anxiety and depression are even more common (Carvalho et al. 2007, Amelink et al. 2014, Shaw et al. 2015). In people with severe asthma, 38% report current symptoms of anxiety and 25% report depression (McDonald et al. 2019). Anxiety was 1.4 times more common in people with severe compared with non-severe asthma and depression was 3.3 times more common. As shown below, anxiety and depression impact people with asthma and the community in many ways. Alongside poor asthma control, asthma and depression make a large contribution to impairments in quality of life amongst people with asthma (Sundbom et al. 2016). Anxiety and depression are associated with impaired functional outcomes and increased health care utilisation in adolescents and adults with asthma (Deshmukh et al. 2007, McCauley et al. 2007, Roy-Byrne et al. 2008, Schneider et al. 2008, Baiardini et al. 2015). Health care costs are much higher for people with comorbid asthma and mental health problems and there may be broader economic costs due to reduced productivity at work and school and premature mortality (Hutter et al. 2011, Walters et al. 2011). People with anxiety and depression are more likely to have risk factors associated with poorer asthma outcomes. These include smoking, poor self-management, reduced treatment adherence or overuse of medication, low physical activity, fear in response to asthma symptoms, higher body mass index, lack of social support, and negative thoughts and emotions, such as hopelessness or reduced self-efficacy (belief in your ability to perform tasks) (Bender 2006, Deshmukh et al. 2007, McCauley et al. 2007, Shaw et al. 2015). Anxiety and depression may directly impact on lung function, which may increase vulnerability to exacerbation (Han et al. 2016). This may happen through panic symptoms such as hyperventilation (Deshmukh et al. 2007) or negative emotions such as sadness (Opolski et al. 2005). Anxiety and depression are formally diagnosed after assessing an individual’s symptoms and impairment against specified diagnostic criteria and ruling out other possible causes of symptoms, such as other mental disorders or medical conditions (World Health Organisation, APA DSM-5 2013). Relevant to asthma would be to consider hyperventilation or dysfunction breathing as an alternative or co-existing diagnosis (Australian Asthma Handbook). The figure above indicated the symptoms assessed for depression diagnosis (APA DSM-5 2013). 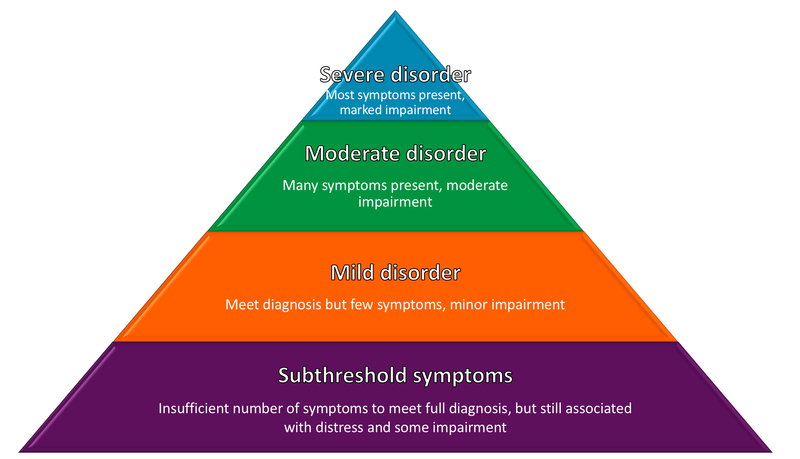 Subthreshold symptoms that do not meet the formal criteria for diagnosis but are distressing and cause impairment are also recognised as important. In practice, anxiety and depression are most commonly assessed through self-report questionnaires. Responses to validated questionnaires can describe symptom severity, increase the chance of detecting mental health problems, and can inform and evaluate treatment (Radhakrishna et al. 2017). Unfortunately, anxiety and depression are under-diagnosed and undertreated in people with respiratory disease. A systematic review of asthma multidimensional assessment revealed that psychological health status was only assessed in two thirds of patients (Clark et al. 2017). Screening for anxiety and depression in people with severe asthma is recommended and they are simple validated screening tools that can be easily implemented in the clinic. See Resources – Comorbidity Components for more information. A score of > 8 in either domain indicates possible anxiety or depression. Mental health problems in people with asthma are undertreated (Valença et al. 2006). Recognising and treating anxiety and depression quickly aids recovery. Shown below is the range of evidence-based options to improve anxiety and depression. 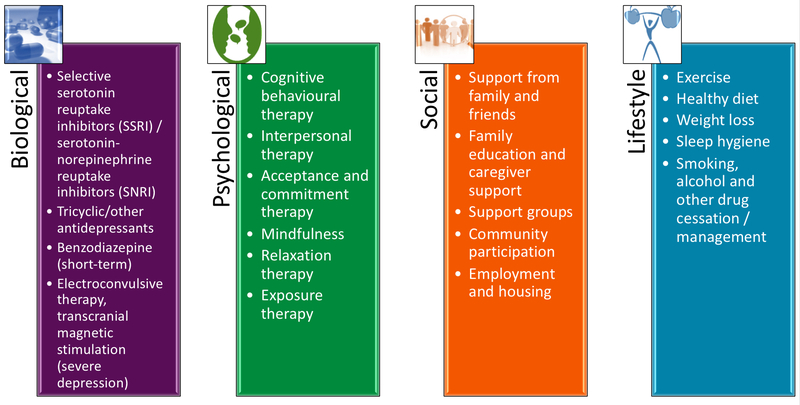 Psychological therapy or counselling services can be delivered face-to-face through specialist practitioners including psychologists, counsellors, social workers, psychiatrists and mental health nurses. Internet or telephone-delivered psychological therapies are also effective, either as a stand-alone service or therapist-supported service (RACGP 2015). Antidepressants (e.g., selective serotonin reuptake inhibitors (SSRIs), serotonin and norepinephrine reuptake inhibitors (SNRIs), tricyclic antidepressants) help both depression and anxiety. Benzodiazepines may be useful for managing short-term crises however are not recommended for long term use due to poor long term outcomes and adverse effects (NICE 2011). People with anxiety and depression may also find benefits in engaging in physical activity, yoga, meditation, relaxation and healthy eating. 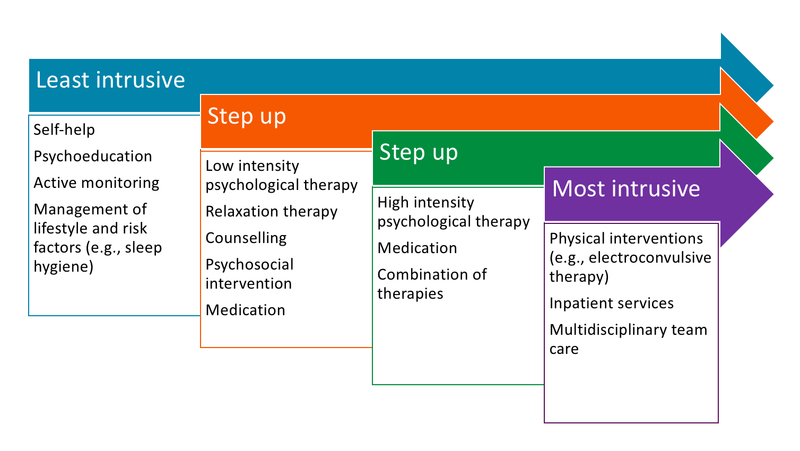 Stepped care is recommended for managing anxiety and depression (NICE 2011, Malhi et al. 2015). The individual is offered the least intensive treatment that might relieve their symptoms and treatment is advanced to the next, more intensive, step if they do not improve. Stepped care for anxiety and depression, adapted from (Malhi et al. 2015, NICE 2011).